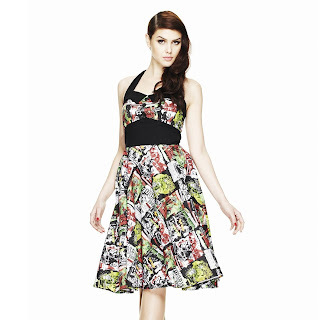 I first discovered the fashion delight that is the Hell Bunny brand when my daughter bought a dress for a wedding. It was the Rocka Tattoo dress, absolutely gorgeous! The quality and detail in the fabric was what stood out to me most, especially when she told me she had only paid £30 for it, well worth the money let me tell you! Recently amusing myself with Squidoo, I decided to set up a lens to showcase 50s Rock n Roll Retro Dresses by Hell Bunny and quite quickly it became clear to me that Hell Bunny was the brand to choose as my focus. Hell Bunny have so many swing style dresses to choose from and have recently released their Spring 2012 collection to add even more glamour to their retro style selections. The dresses all look great on their own, or can be made even more gorgeous by wearing one of their 50s style petticoats underneath. These come in a range of colours too. So far, Hell Bunny stockists seem to have been limited to the UK, but recently they have started to make an appearance in the European and US markets too. Luckily for us, there is a number of reputable online stockists such as Amazon who have recognised the appeal of the Hell Bunny style. The Hell Bunny fashions are extremely versatile and because they are so eye-catching they would appeal to everyone. Generally though, the vibrant patterns and use of gothic, punk and emo graphics in their fabric prints does make Hell Bunny the ideal choice for those who look for alternative fashions and more unusual clothing. On first glance, the patterns appear to be regular floral, patchwork or shaped designs - but when you look closer you will see skulls, geishas, devils and other amusing images included amongst them! Hell Bunny 50s dresses are perfect for any spring/summer occasion, we'd recommend them for weddings, christenings, prom dresses, evening wear, day wear .. in fact, just about anytime, any place, anywhere!